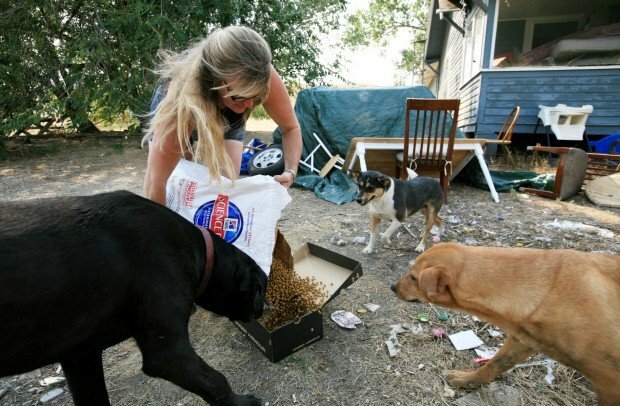 Sheri Lee puts out food for three dogs at a home in Crow Agency. The two female dogs on the right were spayed at the expense of Rez Dog Rescue and returned to their owners. Their puppies were adopted out. Sheri Lee carries a puppy to her car at a home in Crow Agency. The owner of the home had been feeding the stray dogs in the neighborhood and gave Lee five to spay and adopt out through Rez Dog Rescue. The black puppy and his littermate were adopted out together and renamed Abby and Shadow. Three puppies crawl into a bag of food put out by Sheri Lee at a home in Crow Agency. The owners of the puppies gave them up for adoption through Rez Dog Rescue. Sheri Lee gives a bordatella (kennel cough) vaccine to a puppy at her home in Billings. Sheri Lee carries an armload of vaccinated puppies back out to the yard at her Billings home. Sheri Lee of Rez Dog Rescue holds Shirley, a puppy up for adoption through Rez Dog Rescue, so Molly Mangus, 4, can pet her during an adoption event at PetSmart. The rescue has adoptable animals at PetSmart most Saturdays and Sundays. Sheri Lee holds Pipp, a puppy pulled from under a car in Crow Agency. The owner of the house said he had been feeding stray dogs, and gave five of them to Lee to spay and adopt out. Sheri Lee checks out a stray dog found along the highway in Crow Agency. The dog was named Twiggy by Lee because of her skinny frame, then renamed Charlee by her new owners. After being picked up on the side of the road in Crow Agency, a dog that Sheri Lee named Twiggy because she was so skinny rides in the back seat of her SUV for the drive back to Billings. Twiggy licks Sheri Lee on the chin while relaxing in the backyard. After being adopted by Riley and Yvonne Kelly, Twiggy, now named Charlee, sits between her new family members Carson, 2, and Camden, 17 months. Charlee runs around on her new family's property near Billings. Sheri Lee carries a dog to her car after the man who had been feeding neighborhood strays gave her and four other dogs to put up for adoption through Rez Dog Rescue. The back of Sheri Lee's car displays her support for animal rescue. As Cammie looks on, left, Sheri Lee gives Felicity a parvo/distemper vaccination at her home in Billings. Sheri Lee holds Shadow while the dog's new owner, Robin Butcher of Nye, fills out adoption paperwork at Lee's home. Robin Butcher of Nye greets her two dogs, now named Abby and Shadow, as she picks them up at Sheri Lee's house recently. The two dogs were picked up from under a truck in Crow Agency. Sheri Lee sits with River, a dog from the Crow Reservation now up for adoption, during an adoption event at Tractor Supply Co. in Laurel. Sheri Lee stops at a home in Crow Agency to drop off food for a dog she paid to have spayed, then returned to her owner. Stray dogs in Crow Agency. Chris, a puppy up for adoption through Rez Dog Rescue, plays in Sheri Lee's yard. A skinny puppy crosses the road in Crow Agency. The puppy and her littermates were given up for adoption by their owner. Shirley, left, and her littermate Danny, two puppies from the Crow Reservation play in the yard at Sheri Lee's home in Billings. Sheri Lee holds a puppy on her lap as people look at the dogs up for adoption through Rez Dog Rescue during an adoption event at PetSmart. On a late summer day, Sheri Lee sits next to a plastic enclosure filled with two litters of puppies near the front door of PetSmart. While one of the younger puppies tugs on a sleeping older one, trying to engage it in play, a woman walks up to inquire about the animals. All are dogs that Lee has rescued off the Crow and Northern Cheyenne reservations. The mother of the older ones is about half pit bull, Lee said, but she hasn’t a clue about the breed of the father dog. “I would guess on the two black ones probably some border collie or something, and I was thinking boxer” for a blond one, she said. On this day Lee is where she usually can be found on weekends. She’s sitting in the very public spot that draws animal owners and animal lovers, hoping to secure new homes for the unending supply of canines she collects under the banner of Rez Dog Rescue. The 50-year-old Billings woman is immersed in the world of reservation dogs. She finds them — mostly puppies but some adults — nurses them back to health, when necessary, and cares for them at her home until new owners can be found. “If I thought that I let a dog die, I wouldn’t be able to sleep at night,” she said. Though she spends endless hours at the task, it only fills her off hours. Lee works full time in sales and customer service at Lumen FX, a lighting agency in downtown Billings. She started doing dog rescue about eight years ago. Neither reservation has an animal shelter to care for stray pets. She began by helping Charlotte Heinle in Hardin, who headed up Help Every Pet. When Heinle moved to Wyoming, Lee created Rez Dog Rescue. Pets have always been part of her life. She owns four dogs of her own — all reservation dogs that she adopted — and her roommate has one dog. And Lee often fosters dogs and puppies at her home near the Rimrocks that she has found on her tours of the two reservations. She finds the dogs in different ways. Sometimes she gets calls to come pick up litters of puppies. A couple of times a month, Lee drives through the reservation towns — Crow Agency, Lame Deer, Lodge Grass, Busby, Dunmore, Pryor — looking for strays. She drives around in her White Toyota 4Runner with the license plate "DOGMAW." She offers to take older dogs and have them spayed or neutered and then return them to their owners. A couple of teachers in Lame Deer and Lodge Grass also bring litters of puppies they find to Lee. The animals are not initially as cute and cuddly as the ones on display. Lee does everything necessary to get them into good health. Then she takes them to a vet to get them spayed or neutered, vaccinates them and puts them up for adoption or they are adopted through Billings Animal Rescue Kare (BARK). She makes them available on petfinder.com and at PetSmart. To help cover the cost of caring for the dogs, the puppies go for $150 and adults range from free to $100 each. Lee is working to secure a nonprofit status for the organization. She gets financial donations from some people, and BARK and the Billings Animal Shelter donate excess dog food. The animal shelter gave her a truckload of food and a month later, she had to buy more because she’d gone through it all. Most goes to feed the dogs on hand, but Lee also drops off bags of food to dog owners on the reservation when she makes her regular drives to pick up dogs. In addition to donations, Lee has people who offer to foster puppies and adult dogs. She’s always looking for more volunteers. Lee figures that for every female dog that is spayed, that’s at least 100 puppies that won’t be born. But she knows her job will never really be done. Lee also knows that the work is necessary. But it isn’t always easy. She talked about a dog that she rescued from Lodge Grass that wasn’t eating or drinking. So Lee took it in for a checkup. Most of the dogs are hardy, though, Lee said. They’ve been able to survive without much care, and because they’re mixed breeds, they don’t deal with some of the genetic issues that purebreds face. Most are smart because they come from herding-dog stock, she said. And the older dogs are especially grateful to find homes and love after their poor beginnings. “It’s just wonderful,” Lee said. The dogs she rescues make great pets, she said. On the day of an interview outside PetSmart, she adopted out one puppy to a woman who contacted her through petfinder.com and she sent an older dog out on a trial basis. “With the adults, we let you try them first if you’re in town to make sure it’s going to work for you and the dog,” Lee said. Lee said the work can be both satisfying and devastating. To learn more about adopting a dog through Rez Dog Rescue, to volunteer or make a donation, contact Sheri Lee by email at mutt_lee@hotmail.com.